Waif-thin citizens of the faerie world. The Diet Sprite (Faunus victu) is a monster of Godville, related genetically to many of the other fairies, sprites, and pixies also found there. The Diet Sprite is distinguishable from other similar monsters by its extremely thin appearance and total avoidance of fattening foods. 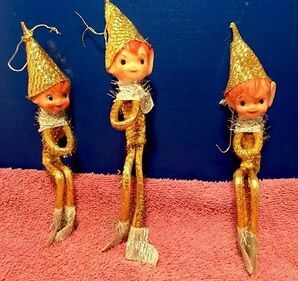 Diet Sprites are simultaneously looked upon with admiration for their slim figures, and deep jealousy (also for their slim figures). A few decades ago, it had become fashionable amongst those who try to be fashionable to be very, very thin. Referred to both as the "waif look" and "heroin chic," it had suddenly become the epitome of physical attractiveness to be as skinny as possible. Heroes, traders, bartenders, and even monsters were going to great lengths to try to achieve this extreme beauty standard. Two itinerant enchantresses, recently arrived in Godville, understood that they could use their magic to help paying customers achieve the desired physique. Practicing their dark arts deep in the woods at night, they invoked and conjured and thaumaturged in an attempt to perfect the process. As a result of their magicking, a rift opened in the milestone-diary entry continuum, and through it poured dozens of very thin, fairy-looking creatures. These were the original Diet Sprites. Some psychopaths squeeze an effervescent liquid from the bodies of still-living diet sprites, then consume it as a refreshing beverage. 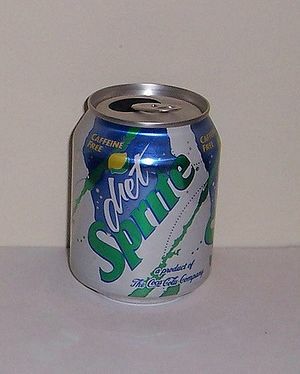 Due to their small size, over 9,000 diet sprites were needed to fill this can. As their slim frames would suggest, Diet sprites inhabit the low-carb and fat-free woodlands between the towns of Godville. While not going so far as to engage in an exercise regimen, they spend their time sipping on lo-cal water, chainsmoking, and cattily dissing each other's rumored weight gain. They try to avoid open fields and meadows, since even a weak breeze blowing across these spaces will carry the lightweight diet sprite off in a hurry. Diet sprites can wear the latest and trendiest fashions in fairy-wear, and never miss an opportunity to complain that their size 0 clothes are "just too big." Diet sprites have a particular dislike for heroes, due to the strong aroma of high-carb, grain-based beverages that is always on their breath. This rage fuels their attacks against adventurers, allowing them two attacks each turn; however, due to their wasted muscles, diet sprites only do half damage. The treasure or trophy possessed by a diet sprite will be stashed away in a nearby hollow tree or similar hidey-hole. The weight of these items is too much for the creatures to carry while trying to battle with heroes. Look great in skinny jeans. Two attacks per turn vs. adventurers. Weakness (due to lack of nutrition). Will blow away in a strong breeze. ↑ Parodied in contemporary publications as the "wafer look." ↑ ...and, let's be honest, their clothes as well. ↑ Plus, they don't like carrying bulky things in their pants pockets. This page was last edited on 28 January 2019, at 00:13.